New! 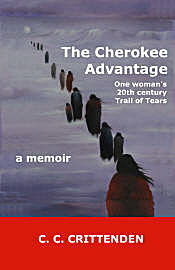 The Cherokee Advantage is available from the Apple iTunes Store as an iBook. 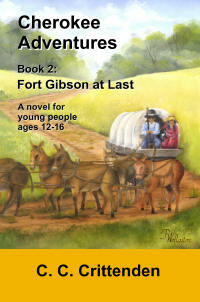 Ride along as Aaron Crittenden and Linnie Tikaneesky Crittenden complete their perilous journey in a covered wagon from Sturgeon, Missouri to Ft. Gibson, Indian Territory, in 1867-68. The couple become an important part of the Fort Gibson community, and, with the help of their neighbors, build a home (and help with building homes for the others in town). Aaron establishes a furniture-building shop, and the couple are able to barter his works for many necessities. Their dog White Star gives birth to a litter of precious puppies; their father was a coyote, so they are especially interesting, and most are adopted by neighbors. Linnie gives birth to their son, whom they name John Ross Crittenden, after John Ross, a respected former Principal Chief of the Cherokee Nation. We see John develop into a precocious lad. 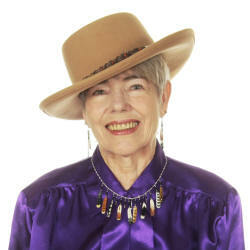 The book gives an insight into how, in many ways, life in the Indian Territory in the late 1860s was dramatically different from the life most of us experience today and yet, in many ways, at the real human level, perhaps not so different after all. Although this is fiction, the characters Linnie and Aaron Crittenden and John Ross Crittenden are modeled after the author's own great-great grandparents and her great grandfather. The book can be purchased through Lulu.com. Just click to go to Lulu.com and search on "Cherokee Adventures". Ride along as Aaron Crittenden and Linnie Tikaneesky Crittenden make their perilous journey in a covered wagon from Sturgeon, Missouri to Ft. Gibson, Indian Territory, in 1867. Aaron, just released from his service with the Union Army, travels to Sturgeon to tidy up his deceased wife’s affairs, and while there meets and is strongly attracted to the beautiful Linnie Still Tikaneesky (both are half Cherokee Indian). The courtship begins, and even though she is not totally convinced that Aaron is the man for her, she eventually accepts his marriage proposal. They make their way through wilderness and mountains as their adventures lead them into danger from wild animals, weather and outlaws. But, the beauty of the land is not lost on them, especially Linnie. She marvels at the abundance of herbs, flowers and wild fruit and vegetables growing near waterways as she makes use of these in her meal preparations along the trail. This book is a forerunner of events to come with the nearing of time for Linnie to give birth to their first child, her dog White Star to have a litter of puppies, and more perils ahead as they doggedly trek to Indian Territory. Although this is fiction, the characters Linnie and Aaron Crittenden are modeled after the author's own great-great grandparents. At first glance, you may think this is just another sad tale of molestation and neglect, but it is not. You will marvel at the courage and ingenuity of this human being as she struggles through adversity and survives in great style. Time after time she reaches deep into her soul for the wisdom and courage of her Cherokee ancestors in solving her dilemmas. Carla is firmly convinced that her Cherokee ancestors imbued her genes with their courage, survival instincts and intelligence. She calls this The Cherokee Advantage. Carla’s misguided mother kidnapped her from her Cherokee paternal grandparents on her fourth birthday, August 10, 1942. This is a true “warts and all” memoir as told from her viewpoint starting from her earliest memory at age four. Her paternal grandmother taught her to read between the ages of 3 and 4. Carla was born with a naturally optimistic outlook and this shines through even the most horrific events occurring in her life. She is subjected to sexual and physical abuse from the age of four. Yet she manages to make the best of every situation, doing whatever it takes to continue forward, confident in her belief that something better is always ahead. When she was 14, her mother arranged her marriage to a 19 year-old airman, thus solidifying the on again-off again volatile relationship with her mother. Pregnant for most of her teenage years, resulting in the births of four children, she survives violent spousal abuse and the death of one baby. Finding herself alone, by choice, with three children, she desperately reaches out for help in taking care of them. This leads to unwise marriages to men who abuse her and want to possess her. Along the way, she successfully holds many jobs in different spheres and these jobs along with her constant reading are her education and confidence-building mechanisms. Her story has immense sadness and failure at times, but it also highlights her courage and intelligence in finding her way along her trail of tears to well deserved happiness. The book can be purchased through Lulu.com. Just click to go to Lulu.com and search on "The Cherokee Advantage".